There’s a sign, facing you as you leave the car park at the Loch Fyne Oyster House pointing towards ‘Britain’s Tallest Tree’. In the several times I’ve been to Loch Fyne over the last six months, this sign has been the subject of much discussion. 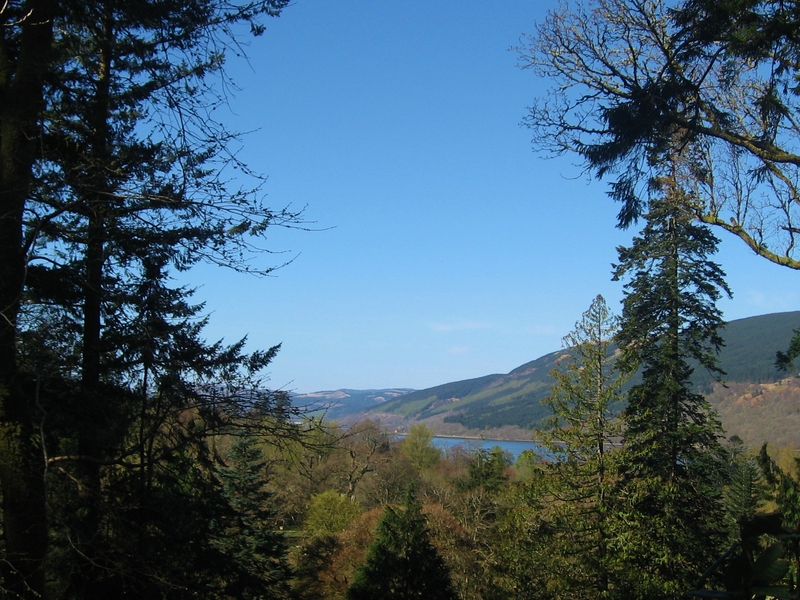 Surely, if there was such a remarkably tall tree just off the road beside the loch we would have noticed it before now? We’ve been visiting the oyster house since its beginnings as a caravan in a lay-by; the tree must have been hiding all this time. How could we have missed it? 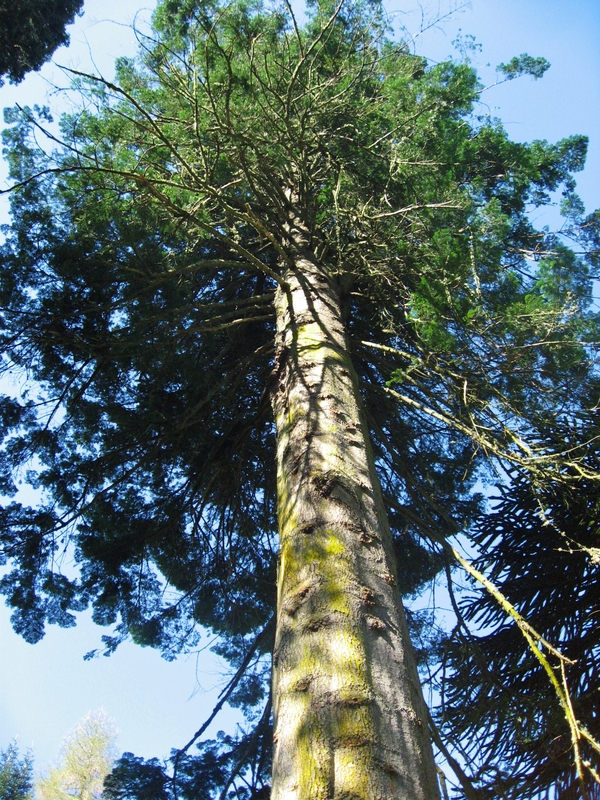 On Friday we decided to make special expedition to search out this tallest of specimens, with the promise of carrying on to the the restaurant for lunch, even if the tree thing turned out to be a bit disappointing. And anyway, the drive from Helensburgh to Loch Fyne is beautiful, no matter what the weather, and there’s always the progress of the never ending construction works to mitigate the frequent landslides on the Rest and Be Thankful to review en route. The turning off the main road to the Ardkinglas Estate is a sharp one, followed by a steep descent along a narrow lane, stone walls on either side, and finally, if you are approaching from the south, a sharp left turn, doubling back on yourself. There’s a lot more land between the road and the edge of the loch, than I’d ever appreciated, and it slopes quite dramatically down towards the waters edge, leaving room and elevation for the mystery tree to have been flourishing for over a hundred years, unseen and unremarked, at least by me. The Woodland Garden was established, like so many idiosyncratic things in this country by a wealthy Victorian who liked collecting stuff from around the world. In this case trees, shrubs and bushes; collecting his own, and playing swapsies with his neighbours and sometime collecting rivals. A folded pamphlet showed us a route around the garden pointing out the highlights. The rhododendrons were in early flower, as well as the delightfully named skunk cabbage, and we could see where the blue bells would be coming in a couple of weeks. The landscape is barely manicured – it’s a collection of trees that have been there a long time, and benign near neglect seems to be the presiding philosophy: where trees have fallen they have been left and the path has been rerouted around them. And there is the tallest tree in Britain. Or it was the tallest tree in Britain for a bit. It’s not at the moment, although I am unclear if that makes it the second tallest tree in Britain, or if it has fallen down the rankings even further. It’s been playing tag with another specimen just outside Inverness for the last few years, but at 64 metres you still have to bend your head quite far back to look up at it. The biggest surprise for us was the extent and prettiness of the Woodland Garden, so when topped off with Scallops and chips at the Oyster House (and astonishing blue sky), the day out ranks as a success. After such a dreary and wet winter, the Spring sunshine is very welcome. 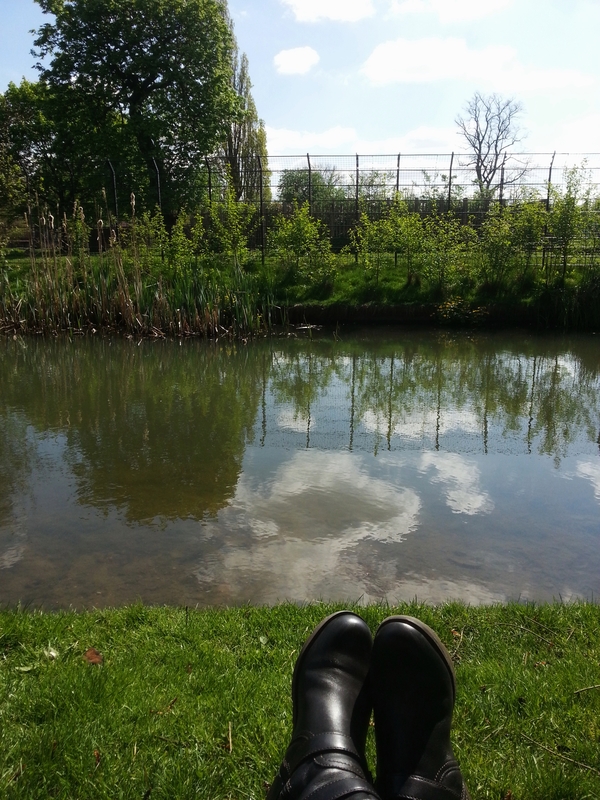 Not only was it shining on Thursday, it had been out long enough to dry the ground sufficiently for me to sit on it and only get slightly damp. Clissold Park is one of those places in north London that I have driven past more times that I could count, yet have never actually set foot in, so having a drawing class outing there provided an opportunity to tick it off the list of ‘things I’m too ashamed to admit I’ve never done in London’. We were remarkably lucky with the weather, and as the day progressed more and more people joined us in the park. Stoke Newington is the land of the organic babycino and all terrain baby buggies, but dog walkers, cyclists and small boys playing football were also lured out into the open by the sun. People watching was compulsory and compelling; as well as eavesdropping on conversations. Or is that just me? (Fran, over at Sequins and Cherry Blossom recommended the cafe for the people watching, but was silent on the eavesdropping ……) And our small sketching party drew our own share of attention, and comment, and even a couple of annoying little dogs which weren’t beyond jumping in the water and then shaking themselves over the sketchbooks of my classmates. It’s all added texture to the al fresco experience. From some angles it is possible to believe that you are not in London, but instead in a small English Market town, with a Green in front of the church, beside The Big House, and we spent the day drawing trees and leaves as well as the reflections in the stream. Later, when I met a friend for supper, she observed that I’d caught a little but of sun on my face. Now, that’s a proper day out! I hadn’t planned to stop for refreshments. Really, the plan was to walk around the town to see the changes since I’d been here last, but I’d already been waylaid by my friend’s boutique and a cotton jumper like the one I bought there last year and have worn and worn. Furnished with my new acquisitions (yes, there were some trousers involved too), I thought I’d spend some time watching the sea in the sunshine. 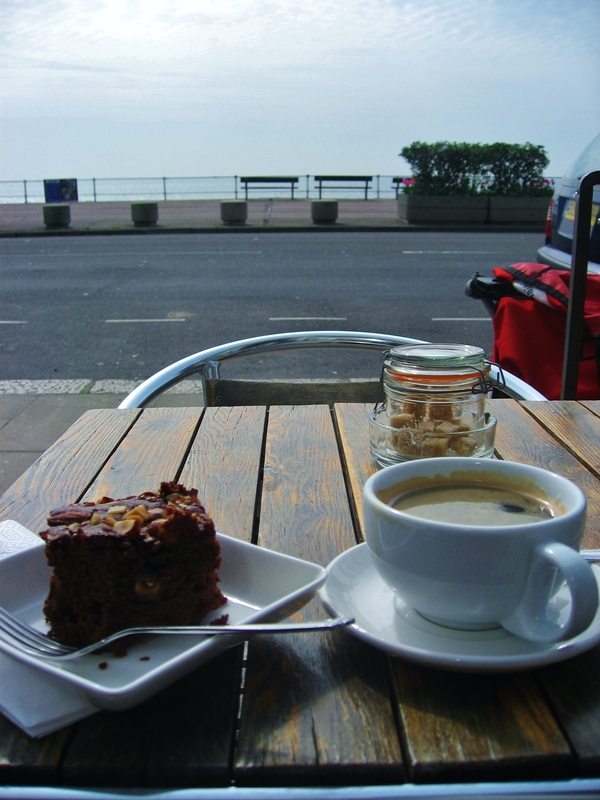 It would have been rude not to have a coffee and a cake too, wouldn’t it? You know how much I enjoy visiting places in London that are new to me. It’s even more fun when I didn’t know they existed before, and they turn out to be idiosyncratic and a bit bonkers. Let me introduce you to The Horniman Museum. If you live in south east London I expect you’ve heard of it already, but for those of us in the North, it was a mystery. ‘South of the River’ represents a transport challenge we’re not always prepared to scale; south east in particular is one of those areas that, for me, is pretty much a blank on the map. So when my Drawing in Museums class was due to take place there, I was torn: it was good to go somewhere new, but how on earth was I going to get there? It turned out to be surprisingly easy, making use of the Overground lines, (which I have avoided since a particularly miserable journey from Richmond a couple of years ago.) It turns out that some of their trains do actually go to where they say they will. The Horniman Museum was established by Mr Horniman using the wealth his family had generated through tea trading in the 19th century. His fancy for collecting ‘to bring the world to Forest Hill’ led to the building of a museum which he left to the people of London. His main areas of interest seem to have been in zoological specimens, handicrafts from far flung cultures and musical instruments. It’s an eccentric collection, but on the day of my visit it was undeniably popular, perhaps too popular, as a destination for the under 10s. A brilliant place for a school trip, for crocodiles of small children to file past glass cases filled with stuffed animals, shells and animal bones before a visit to the aquarium. The noise was astonishing. The barrel ceiling and the wooden and glass cases threw back the squeals and chattering of scores of young voices and the tramp of school shoes on linoleum. 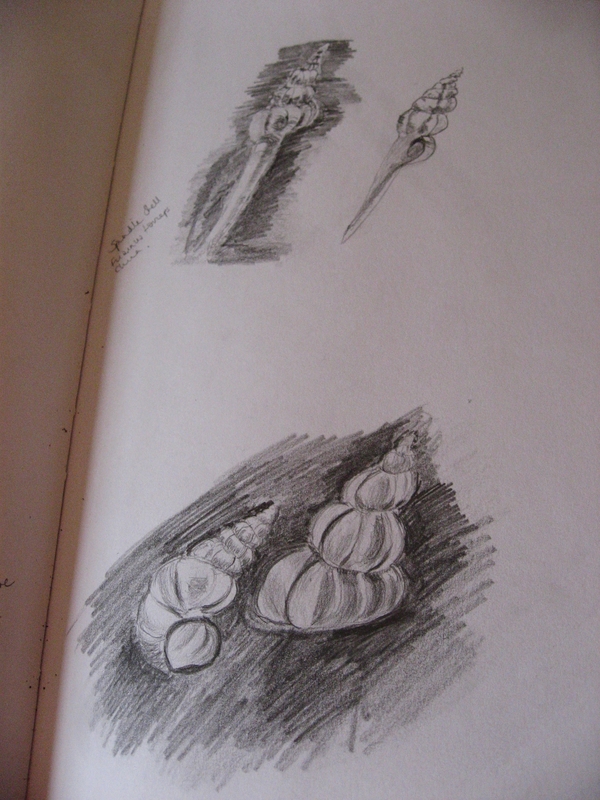 Sitting in front of a glass case of shells, I was the perfect height for the passers by to be able to peer at my sketch book and ask me questions. 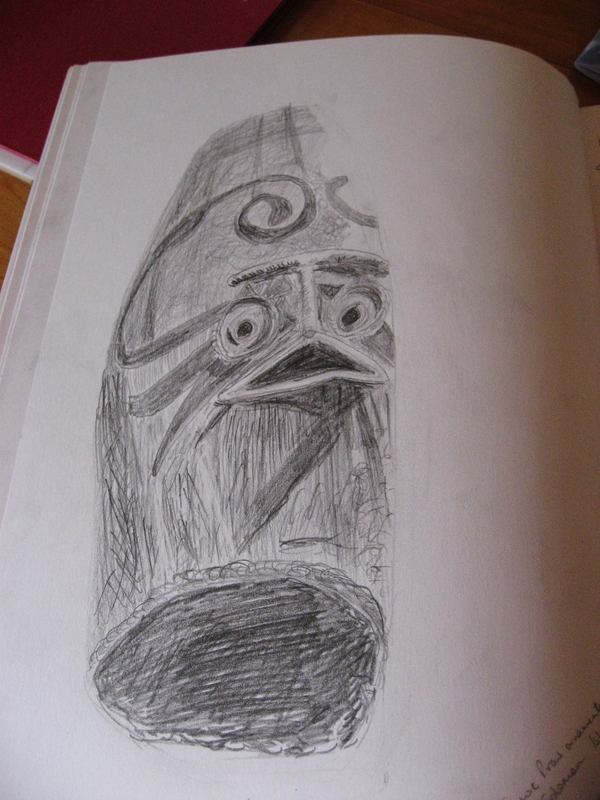 It was quieter in the afternoon, and I spent the time in the Centenary Gallery where I started to sketch a little wooden figure apparently used to decorate the prow of a boat in the Samoan Islands, but my efforts were thwarted when the light that had been illuminating its display case went out. I turned my attention to the chicken mask which is also from the Pacific Islands. Some museum information shed light on the evolution of the curating philosophy of the Collection. At the outset, much of its purpose was to illustrate ‘primitive’ arts from less advanced peoples to prove the superiority of the evolution of the western European. In post Colonial times, the collection has been entirely reassessed and is now organised to show, in the Centenary Gallery at least, the results of the same preoccupation with masks and the illustration of people in different communities around the world. Part of the point of having our drawing classes in Museums is to look at entirely unfamiliar objects, and render them on paper. Their unfamiliarity means that it is not possible to fall into the trap of assuming I know what they look like. I find it a surprisingly relaxing and engaging thing to do. I can sit quietly, and draw. It doesn’t matter if I finish or not, it doesn’t matter if it’s any good or not. It’s just a drawing; lines on a piece of paper. As I’m writing this I realise that I have lost that feeling of freedom to experiment and to fail and it not matter, in my writing. Somehow, if I take it seriously it has to carry more weight and expectation, and it has become correspondingly more difficult. Now what am I going to do with that realisation….? I’m still pondering many of the things I saw on my trip to Berlin; some of the monuments and memorials made a deep impression that I need a little time to think about before writing. In the meantime, let’s talk about the weather. My friend Jill commented on the greyness of the sky in the photo I posted yesterday, so as we were very lucky to see sunshine and blue sky on a couple of the subsequent days, here’s a shot of the bottom end of Unter den Linden. I was standing with my back to the Brandenberg Gate looking east. 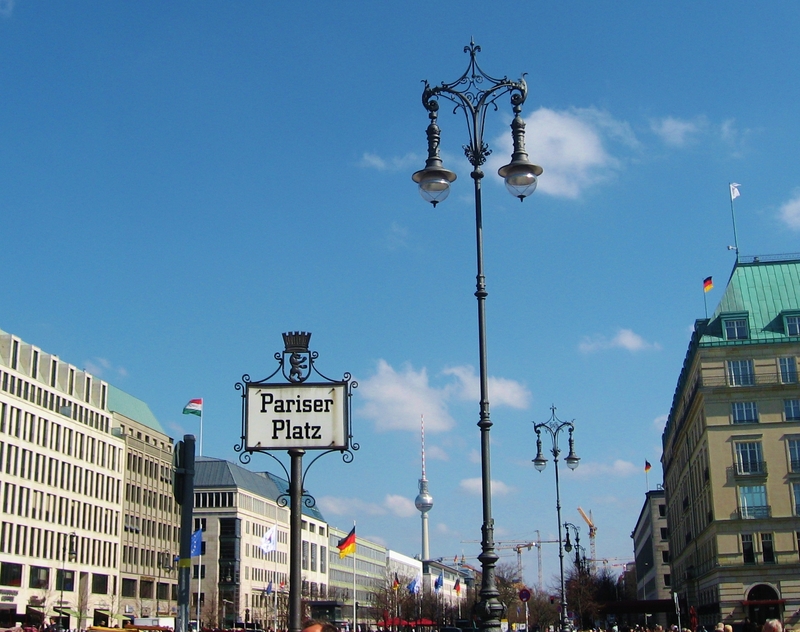 Unter den Linden is, historically, the main promenading boulevard of central Berlin, named for it’s shading by rows of lime trees. At the moment it’s a building site, involving some sort of improvements to the Underground system. Promenading is currently out of the question – indeed on one day the whole road was blocked by the police. On our enforced detour we did come across places we hadn’t known we had wanted to see, but were glad that happenstance had put on our path. I like this composition not only for the blue sky, and the fact that you can’t see the mess of construction, but for the cranes in the distance, the old East German TV tower, so familiar from Cold War iconography, the flags, with which were evident everywhere we went, and I simply can’t resist a bit of curvy ironwork on a street lamp. And for good measure, here’s some more blue sky over Potsdamer Platz where all of the buildings date only from the 1990s and the construction boom that followed the fall of The Wall. 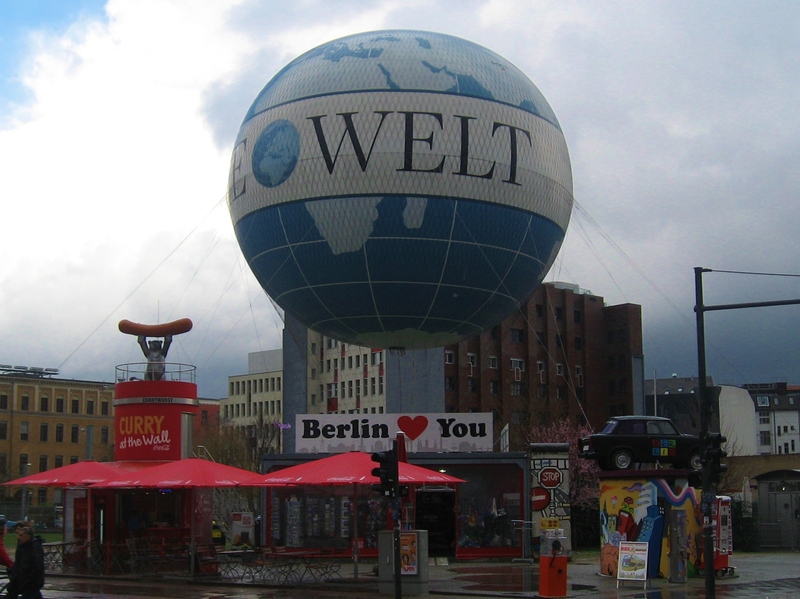 I first visited Berlin in 1990, not long after The Wall came down, when the scars of where it had stood were still unavoidable and prominent. I was there for a work conference, but squeezed in as much of a tour of the city as I could. The images of the derelict land in the centre of the city which featured in Wim Wenders’ film Wings of Desire were still fresh in my mind, and I found their reality all around me. At the Brandenberg Gate I watched people repeatedly walking backwards and forwards across the gap in the tarmac where the Wall had stood; a simple act so long prohibited. The roads were filled with traffic, a chaotic combination of dumpy little Trabants and shining Mercedes monsters. Every tan coloured Trabi filled to capacity with four people, their shoulders crushed together, the tops of their heads pressing on the inside of the car roof; every shining silver Merc occupied by a single driver, luxuriating in space, one hand on the wheel, the other stretched out over the passenger seat….or so it seemed. These were the pictures that stayed with me, and provided the contrast for what I saw on my visit to Berlin last week. A lot has changed in the intervening years. All the cars on the streets are shiny, and the Trabant has been relegated to a historical curiosity, an artefact in a kitsch museum or the vehicle of choice for a novelty ‘safari’ tour of the city sights. 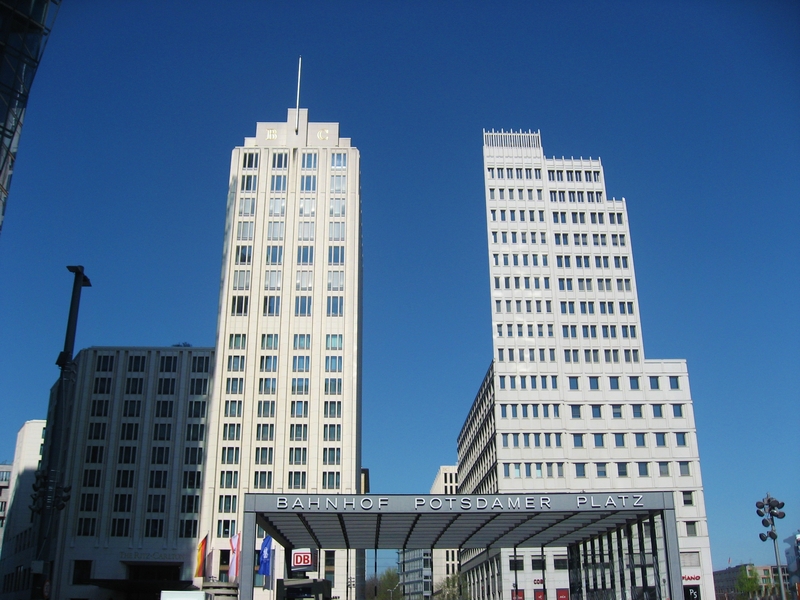 The path of The Wall is evident only in specially preserved areas, and Potsdamer Platz is filled with dramatic high buildings. As we went from sight to sight we walked backwards and forwards across the old demarcation line without noticing it, only periodically pausing to reflect, trying to imagine what it would have been like to have been prevented from crossing from one side of a street the other. We had just visited the Topography of Terror Museum, built on the site of the Nazi Secret Police Headquarters, it was a chastening experience; reading documentary information about the perpetrators of Nazi terror, the banality of the individuals, and the horror of what they did. Deep in our own thoughts, waiting at the lights to cross the road, on our way back towards Friedrichstrasse, there was some relief to see this jumble of tourist tat on the opposite corner. Bear? Check. Trabant? Check. Curryworst? Check. Big Balloon? Check. A sign using a heart to replace a word? Check. Graffiti? Check. It’s still a city of huge contrasts. And yes, I did try a curryworst, and would describe it as a cultural rather than gastronomic experince. I’d not intended to be quiet for so long (again), but my technology has been letting me down a little bit, and denying me access to the WordPress sites, for some mysterious reason. Not only have I been kept out of my own page, I’ve had only sporadic access to the blogs I read regularly. I’ve missed you! So here, in this possibly temporary window of opportunity is a little symphony of trumpets. 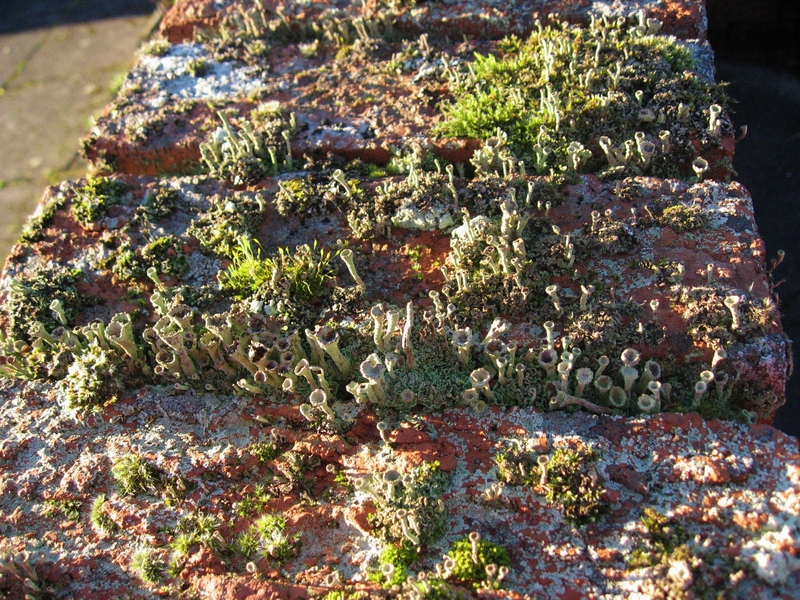 It’s the moss and lichen on the wall outside, and it fascinates me. Are there little people under there spying on me? Or are they playing music I’m not attuned to hear? Or is it a Rogers-esque ventilation system a la Pompidou Centre? Another day, another drawing class, another museum. This time, we were at the Victoria and Albert Museum, and spent the morning in the Cast Court, and the afternoon with the Mediaeval architectural detail. And once again, we were in a nook of the museum, which I’d never spent any time visiting before. The Cast Court is a strange, eerie place. It’s a large space, filled to the glass covered roof in plaster casts of monuments and architectural bits and pieces from around the world, from Trajan’s Column, displayed in two sections, to architraves, to the tombs of Mediaeval knights . Evidently, the collection of such copies was a Victorian obsession, for both the act of collecting itself, as well as providing props through which to educate the contemporary designers about great historical art and architecture. Consequently, much of the collection reflects the Victorian interest in the classical and gothic. With over two hours to dedicate to one drawing, with no letting up of concentration or challenge from the teacher, I was forced to focus entirely on one object, while at the same time feeling the weight of all the other enormous casts bearing down on me. I chose one of the Celtic crosses because I thought the areas of erosion would suit me – it doesn’t matter that the sketch looks like nothing, the thing itself was just covered in nobbly bits…… But the more I looked at it, the more I could discern what must have been the original design of the carvings. 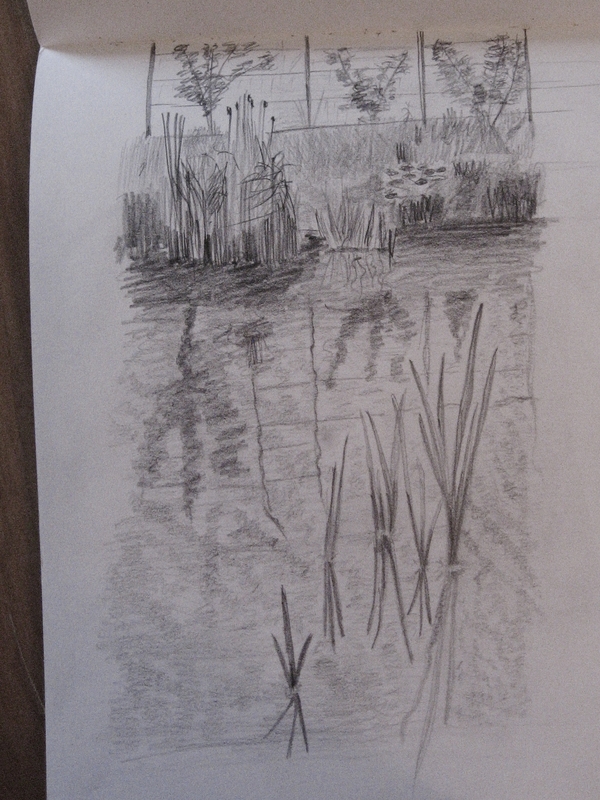 The specific challenge of the class was to draw tonally and without line – I only cheated a little bit. I simply couldn’t work out how to capture the circular element without an outline. The afternoon presented another test for my concentration: hoards of French teenagers. Attracted by the same comfy padded benches in part of the the Medieval Gallery as me, they spent a couple of hours playing with the various features on their telephones, and despite the best efforts of the museum’s custodians, sitting on some of the displays to eat the leftovers from each of their pack lunches, and jeering at their classmates. Finney’s Post, an elderly architectural detail, comes with an entertaining myth. Finney had a wife who was alleged to be a scold. One day, she fell into a stupor and was believed to be dead. On the way to the churchyard, her coffin was bumped into this post and she woke up. She went on to live for several more years, not necessarily to the joy of her husband. The post bore his name ever after. I’m on Mrs Finney’s side. One of the aspects of drawing in museums that I have discovered I enjoy the most, is the enforced opportunity to spend an extended period of time looking at one thing, or at most a small collection of things. For each class, our teacher selects a limited range of pictures or artefacts for us to choose between, and then we have an hour or so to sit, on a little folding stool, in front of whichever one we pick. They are frequently in parts of the galleries and museums that I may never have previously visited, or if I have, I’ve been like all the other visitors, walking past quickly, already gorged or desensitised by the visual overload offered by the institutions. Last night, we were in the Assyrian galleries at the British Museum. In contrast with other Galleries open late on a Friday evening, the British Museum is less busy than during the daytime, when it can be near impossible to walk around the more popular rooms unimpeded by large groups of tourists. I had one room all to myself for the first hour; apart from the occasional visitor strolling past, and the blasts of comically prosaic communication about tea breaks from the attendant’s walkie talkie, I was able to sit and examine the patterns on the relief wall panels, and wonder at the hands that made them, as I failed to capture their essence in my sketchbook. For all my many visit to the British Museum, I’ve never sat in such quiet contemplation there. For the second part of the evening, all the members of the class sat together, gazing up at the monumental sculptures of , trying to capture the strangeness of the beasts; the crinkled hair, the bobbly beards and sharp human features. There’s such drama in studying the details of the sculptures. I admit it – I’m often one of those who just walks by, catching a glimpse of things out of the corner of my eye, and moving on to the next thing, so that I may never remember what I’ve actually seen. But there are days where there is nothing better, calmer and more focussed than just looking at one or two things closely, and then going home. But I have been out and about, seeing plays and exhibitions, and thinking about what I might tell you about them, even if I haven’t yet put pen to paper or fingers to keyboard to write a complete piece (there are lots of short excerpts, and embryonic rants lined up in my drafts folder). In case you’ve not seen the news lately, it’s been raining in the UK, even more than usual. But last week in Trafalgar Square we had that rarest of moments, between the showers, when the clouds cleared to reveal the sky, and the late afternoon sun, low in the sky illuminated the view in front of me. The streets may really be lined with gold after all.